Eating is one of the few joys that many seniors can still look forward to each day, so consider how you can make meals special. Try to serve foods of many colors on her plate. Not only will the food look more appetizing, but it will include a variety of vitamins and minerals. What foods should you serve? 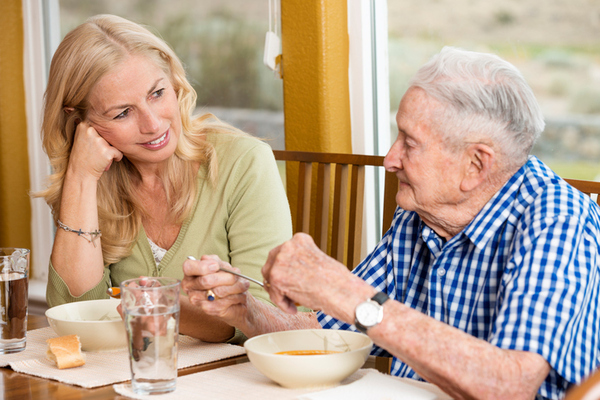 It is helpful to know what foods your loved one likes, so you can serve them often. If you have lived far apart in recent years, you may not know her preferences. Or, possibly, medical issues such as diabetes or heart disease might dictate what foods she can eat. It is essential that you know if she has any food allergies. My mother-in-law has a peanut allergy, so I have to read labels when purchasing many products such as candy, cookies, Asian food (which often includes peanut oil), and others. Some seniors have trouble chewing due to failing teeth or ill-fitting dentures. Others have choking issues, especially those in the later stages of Alzheimer’s and dementia. It may be necessary to serve soft foods or to cut regular food in smaller bites. Consider feeding your loved one foods that were popular with your toddler such as crackers, fruit chunks, string cheese, carrot and celery sticks with peanut butter, bite-size pizza, and others. This can keep her independent longer if she can no longer handle silverware due to dementia or a stroke. The time may come when you will need to feed her yourself, but let her do what she can for as long as she can. Your parent may be a sloppy eater due to coordination or vision issues. Placing a hand towel across her lap can be helpful and less-objectionable than a bib. If you use a bib you might refer to it as an apron; a man might find a barbecue-style apron more acceptable than something that looks childish. Serve small portions so she isn’t overwhelmed. Remember that she probably isn’t as active as she once was, so adjust the portions accordingly. If exhaustion is an issue, serve the larger meal at breakfast when she has more energy. Small frequent meals are ideal, especially if she is a diabetic, plus they help to fill the long hours. Many seniors don’t drink enough fluids to prevent dehydration. Dehydration can cause a multitude of problems including urinary tract infections (UTIs), constipation, kidney issues, and others. Do whatever works to get fluids into her. Although my mother-in-law claims to like water, she never drinks it. I switched to a powdered lemonade mix and she readily drinks that. My sister-in-law found a plastic mug with a straw and a large handle that has become Mom’s lemonade mug. It doesn’t spill and won’t break if she drops it. She drinks about three pints each day and we’ve had no problem with dehydration since. There are other ways to sneak extra liquids into her diet. Serve water-rich foods such as watermelon chunks or soup with lots of broth. Remember that coffee and tea typically rob the body of water, so serve these in moderation. An older person has often experienced many losses: a spouse, a career, friends, driving privileges, health, and personal independence. Well-prepared, attractively served meals served with a smile may be the highlight of her day. Little touches like a colorful napkin or triangle-cut cinnamon toast can brighten the eyes of your loved one. Bon appétit! © 2017 by Marcia K. Washburn. Marcia writes from her home in Colorado. Through the years, she has cared for four adult relatives in her home, and presently cares for her mother-in-law who has Alzheimer Disease. Marcia is the Assistant Director of Christian Family Eldercare. Her book, Home-Based Eldercare: Stories and Strategies for Caregivers, is available at ChristianFamilyEldercare.org.